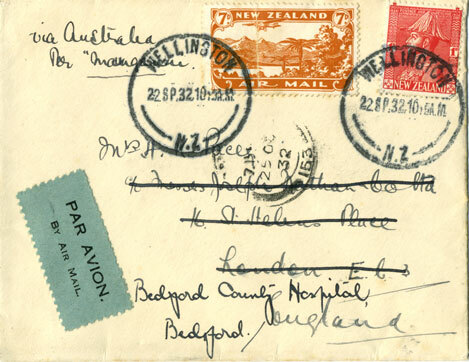 Mail could be sent to New Zealand by the London - Karachi air mail service from 1929, although it was not until July 1930 that airmail could be sent from New Zealand. 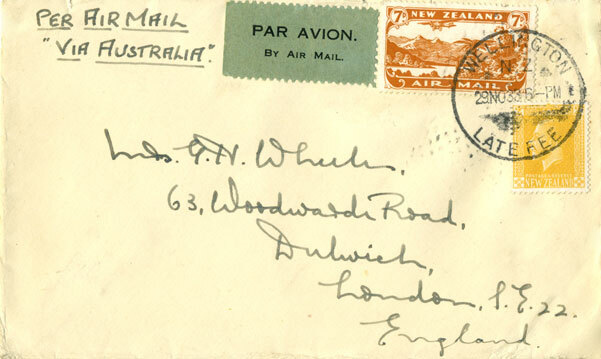 The cover shown below is the only known cover addressed to New Zealand and flown on the first flight leaving London on 30 March 1929. The weekly Imperial Airways London to Karachi air mail service started on Saturday 30 March 1929, but the Post Office had not announced that mail would be accepted for Australia and New Zealand. 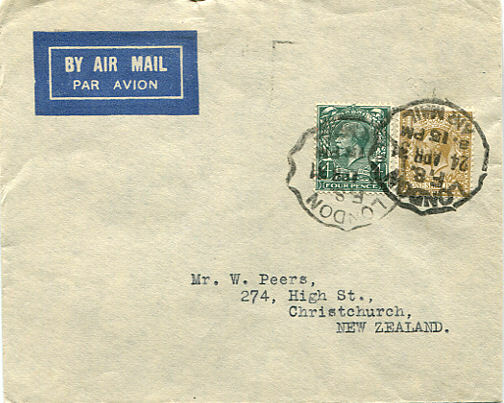 This registered cover is postmarked 28 March in Liverpool and is addressed to F M Paterson in Timaru, New Zealand. It has the manuscript inscription Printed matter and carries postage of 9½d made up of 6d airmail, 3d registration and ½d reduced surface rate. Walker  states that covers to New Zealand have not been previously recorded . However, I have seen two almost identical items, also to Paterson, in auctions; one had registration number 4696, the other 4697 while the shown item has number 4698. The Karachi REG backstamp is indistinct. The date appears to include the characters 6 R 29 (and therefore could be 6 APR 29) while the time is 9 PM. It is known that the plane arrived in Karachi on 6 April. From there mail was sent via Madras and the Dhanushkodi - Talaimannar ferry to Colombo (Ceylon). There it connected with the P&O mailboat Cathay on Saturday 13th April arriving one day early in Fremantle (Perth) on Monday 22nd April. The mail was sent to Sydney by rail where it was delivered on 28 April . From Sydney it likely went to Wellington on the Maunganui from 3 - 7 May . Two covers for Australia are known. 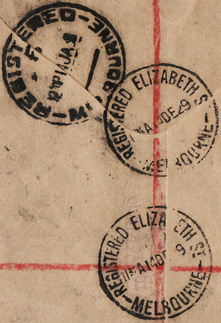 A registered cover from Basra to Adelaide is described in a 2005 auction as having a 27 April Adelaide backstamp which would correspond to it making the expected connection at Colombo with the Cathay. On the other hand, a cover is reported in  as arriving in Rochester, Victoria on Monday 6 May which would correspond to the arrival of the mailboat in Fremantle on Tuesday 30 April. This cover is postmarked in Dorset on Monday 13 May 1929 and is addressed to New Zealand with routing instructions Per Air Mail via India. 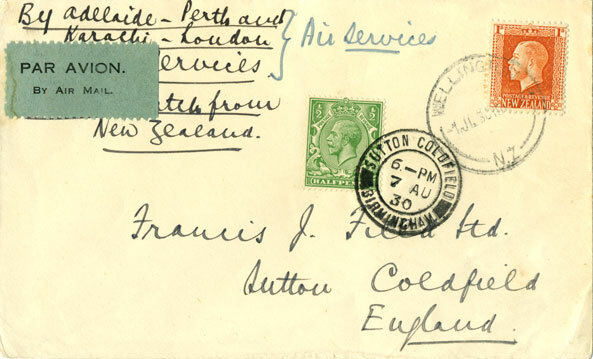 It is correctly franked with 7½d made up of 6d airmail plus 1½d surface and so was intended to be flown from Britain to Karachi, but was sent before the first official acceptance to New Zealand. However, as it has no transit marks, there is no proof that it was flown to Karachi. It was posted in plenty of time to connect with the weekly surface mail to Australia and so sending it by air mail would have given no advantage. If it was flown, it would have gone on IE 8 which left Croydon on 18 May and arrived in Karachi on 25 May. The route from Karachi to New Zealand would be the same as with the previous cover. 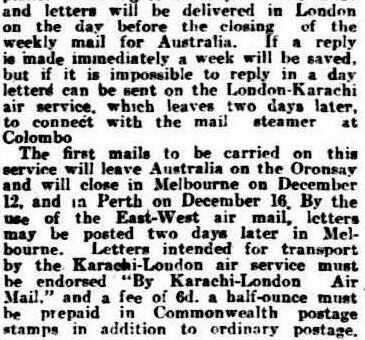 The first official acceptance of mail for Australia and New Zealand using the London - Karachi air mail service is reported in The Times of 30 August. 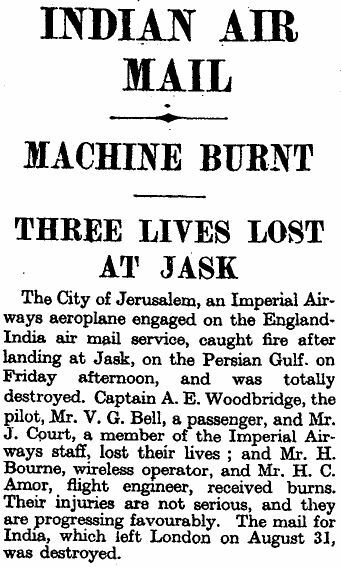 The mail left London on Saturday 31 August 1929 on IE 23, but the plane crashed while landing at Jask in Persia on 6 September. The pilot, Albert Woodbridge, one of the crew and the only passenger were killed . According to the report from The Times of 9 September, the mail was destroyed in the fire. Albert Woodbridge is famous as the airman who wounded and shot down von Richthofen, the Red Baron, in 1917. The first successful official acceptance of airmail for New Zealand via Karachi left London on IE 24 on 7 September, 1929. 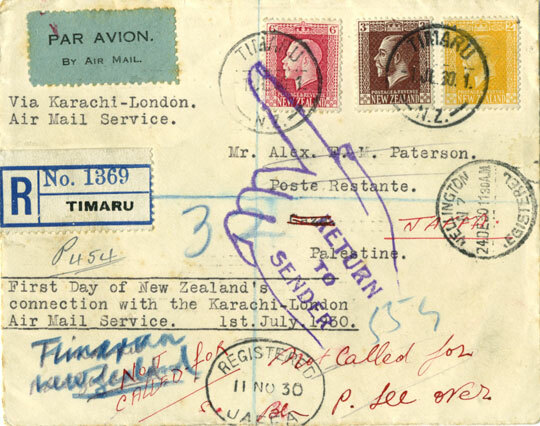 Use of the London - Karachi airmail service, as part of the route to Australia or New Zealand, made little improvement in the time. The last posting each week for ordinary mail to Australia at the London GPO was at 6pm on Thursday evening while, using the airmail service, mail could be posted one and a half days later at 7 am on a Saturday. Given the extra cost, it is not surprising that little use was made of the service to Australia and it was withdrawn between May 1930 and 12 May 1932 . The service to New Zealand was never reinstated. Use of the Karachi - London service from Australia and New Zealand remained. Legg shows the GPO airmail rates schedules to Australia for October 1929 to Spring 1931 and for May 1933 . The October 1929 schedule shows that the air fee for the London - Karachi service had been reduced from 6d to 5d per ½oz and if the Perth - Adelaide service was used in addition, the air fee was 8d. The surface rate of 1½d had to be paid in addition. The London - Karachi service is given the Air Route number 3 while Perth - Adelaide has Air Route number 4. 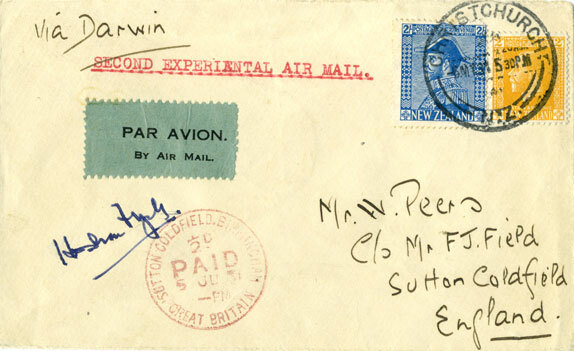 This cover addressed to New Zealand is postmarked in Basrah on 22 October 1929 and so would have been flown on flight IE 30 which left Basra on 25 October and arrived in Karachi on 26 October. However, although it is registered, it has no further postal markings. 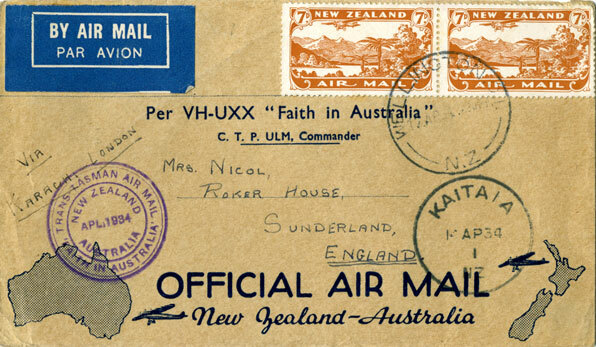 Although mail from Australia to the UK could be flown on the Adelaide - Perth from its inauguration, it was December 1929 before mail could also be flown on the Karachi - London air mail service. The report is from the West Australian of 23 November 1929 . 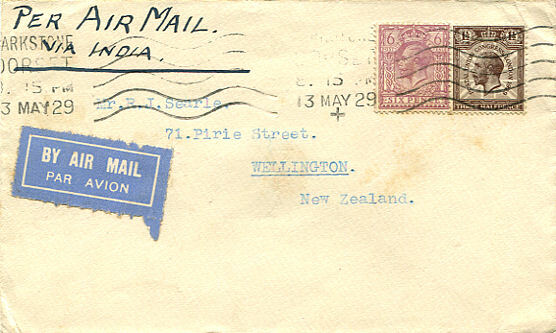 Mail from New Zealand was not accepted until July 1930. 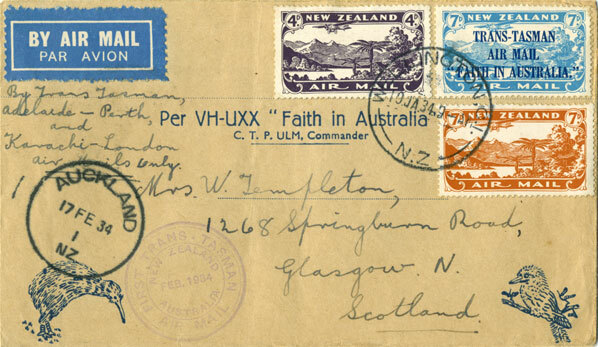 This cover is postmarked 14 December 1929 in Melbourne and has the manuscript Australia - Karachi - London. It was flown Adelaide - Perth and then from Karachi on the first acceptance from Australia. It would have been carried by overnight train on Saturday 14 December to Adelaide and flown from there to Perth on 15 - 16 December where it connected on Monday 16 December with the mail steamer Oronsay for Colombo. It was then taken by surface to Karachi from where it was flown on 30 December arriving in London 1 day late on 9 January , 24 days after leaving Australia. The surface mail on the Oronsay was due in London on 12 January. It is franked with 1s 3d in stamps made up of 3d Adelaide - Perth airmail, 6d Karachi - London airmail, 1½d surface postage plus a registration fee. 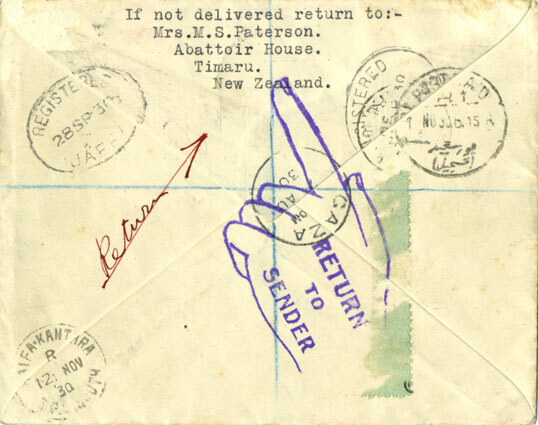 It was not until 1 July 1930 that New Zealand stamps were accepted to pre-pay airmail postage on overseas routes. As well as the Karachi - London route, mail was accepted for Australian, Canadian and US airmail services. 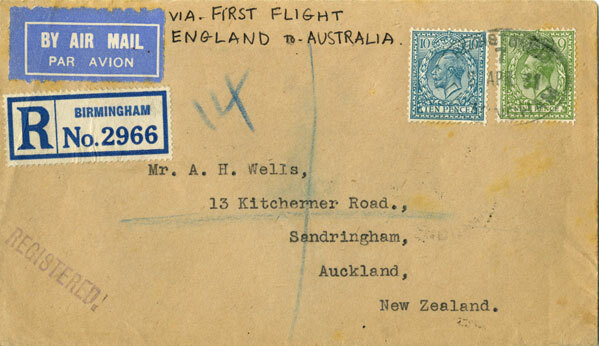 The first mail from New Zealand via the Imperial Airways Karachi - UK airmail route left New Zealand on 11 July. 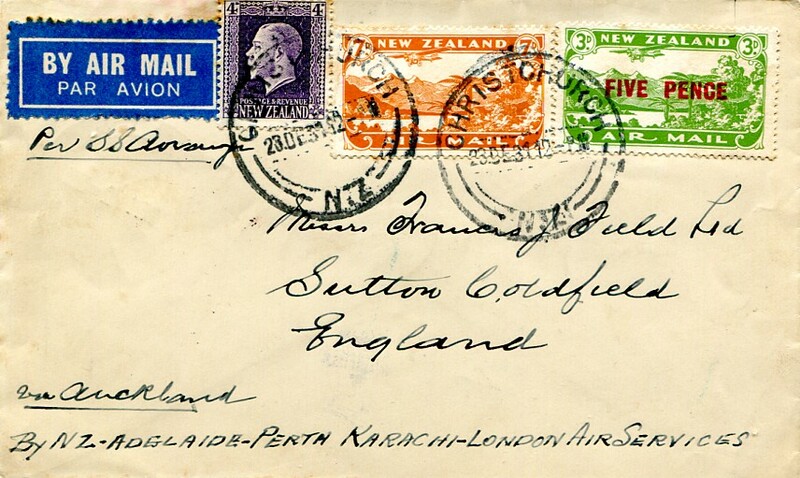 (Mail from Australia had been accepted on the Karachi - London route since December 1929.) The rate from New Zealand was 7d per ½oz plus the normal surface postage rate of 1d. The example cover is postmarked 9 July and went by sea from Auckland to Sydney on the Ulimaroa on 11 - 15 July and then by rail to Perth and was sent from Fremantle on the P&O mailboat Mongolia on 21 July. It was off-loaded at Colombo on 31 July and sent by surface mail to Karachi from where it was flown on flight IW 70 on 5 August, arriving in London on 11 August . The surface mail sent on the Mongolia was due in London on 16 August. The Cairo - London part of the route had changed in April 1930. Mail was sent by rail from Cairo to Alexandria and flown from there by flying boat to Salonica from where it was sent by rail to Skopje (aka Skoplje and Uskub). It was then flown from Skopje to London via Belgrade, Budapest, Vienna, Nuremberg and Cologne. The next cover is registered and so has stamps to the value of 11d being made up of the postal rate of 8d plus 3d registration fee. It is postmarked 1 July in Wellington and has a receiving mark in Ibstock, Leicester dated 12 August 1930. That ties in with the flight arriving in London on 11 August. This cover is addressed to W E Wheatcroft, one of a small number of enthusiasts at that time who regularly sent covers on inaugural flights. There is an article about him in Air Mail News . 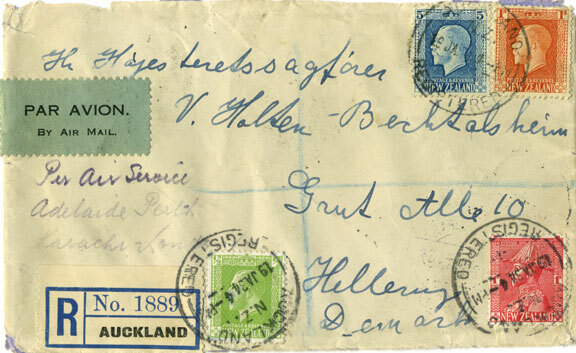 This cover is postmarked in Christchurch on 8 July and is addressed to Switzerland. It has a mixed franking of 9½d in New Zealand stamps plus 2d (unfranked) in British stamps. 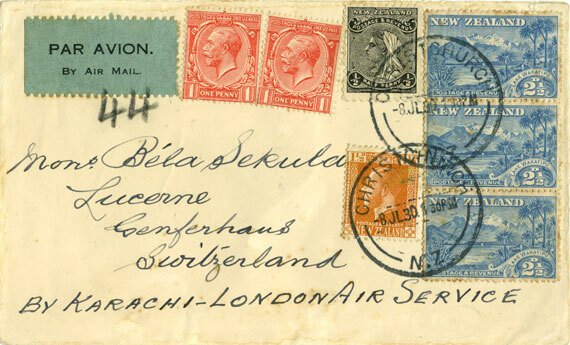 This is made up of 7d Karachi - London airmail, 2½d ordinary postage to Switzerland while the 2d in British stamps is the airmail fee from London to Basle. An almost identical cover is shown in Walker . It is interesting to note that if this cover had been sent to UK by sea and flown to Switzerland prior to 1 July 1930, it would have been necessary for it to have a mixed franking of the surface rate in New Zealand stamps and the London - Basle airmail fee in UK stamps. However, that was now unnecessary as New Zealand stamps could now be used to prepay postage on overseas flights. It is clear that the intention was for this cover to be flown to London and then flown from there to Basle. However, as the flight was through central Europe, it would have been offloaded at Vienna or Nuremburg and sent on by rail to Lucerne. Registered covers that were off-loaded with appropriate transit marks are discussed below. This registered cover is postmarked on 1 July in Timaru and is addressed to Alex Paterson, Poste Restante, Gaza, Palestine. It is clearly philatelic in nature, but the number of backstamps show that a major attempt was made to locate him in Palestine. The cover is franked with 11d which is the same as the earlier registered cover to London and would be made up of 8d postage and 3d registration fee. Although the routing instructions are via Karachi - London Air Mail Service, the cover was off-loaded in Gaza. The service that left Karachi on 5 August arrived in Gaza on 7 August and the cover has a Gaza 7 August receiving mark on the back. Then, in red ink, there is Not called for in capital letters and Gaza has been scored out and replaced with Jaffa. There is a Jaffa receiving mark on the back dated 28 September and a further Jaffa mark on the front dated 11 November with a further Not called for P. See Over in red manuscript. It then seems to have started its homeward journey. There is a Haifa Kantara transit mark on 12 November and a Port Said transit which appears to be 1 November, but is more likely to be 13 or 14 November. It would then be sent from Port Said to New Zealand via Australia by sea and it finally has a Wellington transit mark on 24 December almost six months after it started its journey. There are large Return to Sender cachets in purple with a hand and pointing finger on both the front and back. I think that they were applied in New Zealand. The return address is to Mrs Paterson to add credibility to the notion that Mr Paterson was in Palestine. I have seen copies of similar covers from Alex Paterson addressed to Prague , Athens, Estonia, Luxembourg, Copenhagen, Constantinople and Paris. The Prague, Denmark and Constantinople covers are franked with 1s ½d made up of 7d Karachi - London airmail, 2½d overseas surface plus 3d registration fee. 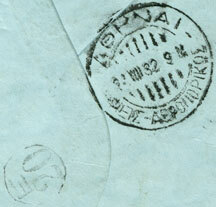 The Athens and Paris covers are not registered and so are franked with 9½d. However, the Estonia and Luxembourg covers are only franked with 11d which would seem 1½d short for a registered cover. The Prague and Luxembourg backstamps are on 12 August and so they were off-loaded in Vienna and Cologne (there is a Koln transit mark) respectively on 11 August and sent from there to their destination by surface. The Kobenhavn Luftpost backstamp is on 12 August and so was likely flown there from Cologne. The Constantinople backstamp is on 12 August with an Athens transit on 9 August. The Tallin, Estonia backstamp is also on 12 August, but there is no transit mark. The Paris backstamp is on 11 August, the same date as the London arrival and so it may have been flown from there. The Timaru Registration No. on the Estonia, Luxembourg, Gaza, Copenhagen, Prague and Constantinople covers are respectively 1363, 1368, 1369, 1373, 1399 and 1410. That indicates that he sent quite a few letters to a range of destinations on this dispatch. Letters could be flown on a combination of the West Australian Airways Adelaide to Perth service and the Karachi - London service at a further cost of 4d per ½oz. giving a combined postage rate of 1s 0d. Whereas mail flown only on the Karachi - London service did not leave New Zealand until 11 July, mail that was also to be flown Adelaide - Perth left on 4 July. Use of the Adelaide - Perth air mail service meant that mail posted in Sydney on a Friday could catch up at Fremantle with mail that had left Sydney on the previous Wednesday. The mail went by rail from Sydney to Adelaide and the Adelaide - Perth air mail service left Adelaide on a Sunday to connect on Monday with the mail steamer for Colombo . This is one of 10 letters from the first acceptance of air mail from New Zealand that was flown on both the Adelaide - Perth and the Karachi - London service. It has the correct franking of 1s 0d. The postmark is 1 July 1930 in Wellington from where it was sent to Sydney on 4 - 8 July on the SS Maunganui. It was then sent from Sydney by rail to Adelaide, flown Adelaide - Perth on 13 - 14 July, left Fremantle on the Barrabool on Monday 14 July for Colombo where it was due on Wednesday 23 July and from where it was sent by surface to Karachi. It was flown from Karachi by Imperial Airways on flight IW 69 on Tuesday 29 July. and arrived in London on Monday 4 August . The surface mail sent on the Barrabool was due in London on 9 August. Delivery in Sutton Coldfield would be expected on 5 August. The recipient is Francis Field, a prominent aerophilately dealer and publisher, who often added a ½d stamp which was then postmarked by favour by the local postmaster. As that postmark is not until 7 August it was a couple of days before he collected the mail, added the stamp and had it postmarked. The important point is that it proves that it was carried on an earlier flight from Karachi than the mail from New Zealand that had not been flown on the Adelaide - Perth service as that mail did not arrive in London until 11 August. According to Walker , only 152 items were sent from New Zealand via the combined Adelaide - Perth and Karachi - London services in the first year which averages at only about three on each flight. Examples like this one are therefore uncommon. It is always interesting to have proof that a service was actually used by the public and that covers exist other than those flown on the first flight. This cover is postmarked on 6 August 1930 and was sent on the Ulimoroa from Wellington to Sydney on Friday 8 - Tuesday 12 August. It was flown Adelaide - Perth on 17-18 August, went by sea from Fremantle to Colombo on the Cathay on 18th - 27th August and then went on the Karachi - London service IW 74 on 2 - 8 September. There is a manuscript on the back stating that it was received on 9 September. It is only franked by 11d in stamps rather than the required 1s 0d. It is not surprising that there was confusion regarding the postage which was 7d Karachi - London. The Adelaide - Perth rate was 4d if addressed to the UK, but 3d for letters addressed to Perth. That extra 1d might reasonably be assumed to cover the surface rate while in fact a further 1d was required. An increase in the surface rate for Empire countries and the USA to 2d for the first ounce and 1d for each subsequent ounce (previously 1d per ounce) was announced on 25 February 1931 and came into affect on 1 March. The registration fee was increased from 3d to 4d and the late fee from 1d to 2d. That meant that the fee for the Karachi air mail to UK was now 9d for the first ½ oz. The surface rate to non Empire countries remained at 2½d for the first oz and 1½d for each subsequent oz. In April - May 1931, Imperial Airways planned two experimental extensions of the London - Karachi airmail service to Melbourne and return. This was the first official air mail between Great Britain and Australia. The Imperial Airways service to Karachi had been extended to Delhi in December 1929. There were Qantas services from Brisbane and an Australian National Airways (ANA) service from Brisbane to Melbourne. The plan was to connect these services with Imperial Airways flying from Delhi to Darwin and Qantas from Darwin to Brisbane. 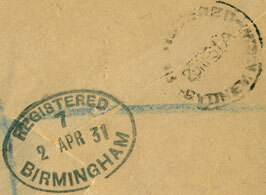 The example registered letter is postmarked Birmingham on 2 April 1931 and is addressed to New Zealand. The postage rate for the flight was 1s 4d per ½ oz. The letter has franking of 1s 7d which includes 3d for the registration fee. The flight left Croydon Airport (London) on 4 April on the regular route to Delhi. The mail arrived in Alexandria on 8 April, Karachi on 12 April, Delhi and Allahabad on 13 April, Calcutta and Akyab on 14 April, Rangoon and Victoria Point on 15 April, Alor Star and Singapore on 16 April, Samarang on the 17th and Sourabaya on 18 April . The DH 66 City of Cairo then crashed at Koepang (Kupang) in Timor in the Dutch East Indies on 19 April. Kingsford Smith, with G U Scotty Allan as co-pilot, flew the Southern Cross from Sydney to Koepang on 21-24 April. They picked up the mail and flew it to Darwin on 25 April. The mail was then flown to Brisbane by Qantas on 27-28 April and by ANA to Sydney on 29 April. The New Zealand mail was forwarded from Sydney to Wellington by sea on the Maunganui from 1-5 May . The return flight for London left Melbourne on 23 April. The mail from New Zealand was sent from Wellington to Sydney on the Ulimaroa on 17-21 April and joined the flight at Sydney on 24 April. Only 229 ordinary and 106 registered letters were sent from New Zealand. The example registered letter is postmarked Auckland on 16 April and has franking of 2s 6d made up as follows: 2d ordinary postage, 2s 0d air mail to Great Britain, 4d registration fee. The cover is backstamped 21 April in Sydney when a special cachet was applied. There is no London backstamp. The New Zealand mail was carried by ANA from Sydney to Brisbane on 24 April and then by Qantas from Brisbane to Darwin, on 25 - 26 April. The plan had been for the Imperial Airways DH 66 to fly the mails from Darwin, but as it had crashed at Koepang and Imperial Airways had no replacement aircraft, Kingsford Smith and Allan, who had arrived in Darwin from Koepang on the 25th, flew the mail from Darwin to Akyab in Burma on 27 April - 3 May. At Akyab, on 3 May, the mail was transferred to the Imperial Airways DH 66 City of Karachi and flown to Delhi, arriving on 5 May. From Delhi it joined the regular Imperial Airways flight IW 109 to London where it eventually arrived on 14 May. The second experimental airmail left London on 25 April and was flown on the regular Eastern Route to Delhi. The DH 66 Hercules City of Karachi had arrived in Delhi on 5 May from Akyab with the mail from the return flight of the first experimental airmail. The mail was exchanged and the City of Karachi immediately returned that day (via Allabad) to Calcutta. It was then flown to Akyab on 6 May. The mail was then flown from Akyab to Darwin from 6 to 11 May by Kingsford Smith and Scotty Allan in the Southern Cross. From Darwin it was flown to Brisbane on 12-13 May by Qantas and then by ANA to Sydney on 14 May with P G Taylor as pilot. 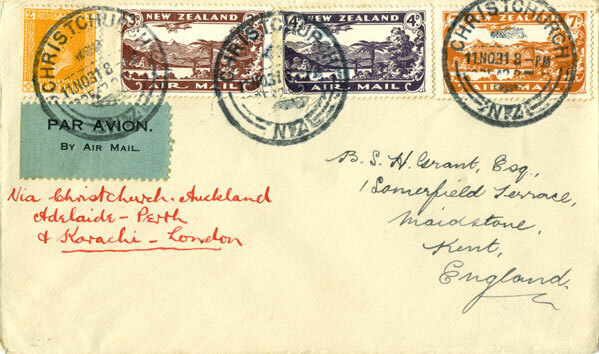 This cover was postmarked in London on 24 April and is addressed to Christchurch. It has a Sydney backstamp on 14 May and a Christchurch backstamp on 19 May. The mail was delivered in Wellington on 18 May  and so must have made a very good connection with the Maunganui which sailed from Sydney to Wellington on 14-18 May . The Monowai left Sydney for Auckland on 15 May, but did not arrive in Auckland until 19 May. There were 266 acceptances from New Zealand for the second return flight and they were carried from Auckland to Sydney on the Maunganui on 8-12 May 1931. This cover is postmarked Christchurch on 6 May. As with the first return flight, the postage rate was 2s 2d made up of 2d ordinary postage and 2s 0d airmail fee. The flight left Melbourne on 15 May and the New Zealand mail joined at Sydney on the 16th. The Melbourne - Sydney - Brisbane leg was flown by ANA in with Jim Mollison as pilot. Qantas flew the leg from Brisbane to Darwin on May 17-18. The pilot was Hudson Fysh, Managing Director and co-founder of Qantas. This was the last time he flew a scheduled service and the cover has his autograph. By this time, Imperial Airways had purchased a replacement DH 66 and it flew the leg from Darwin to Delhi (May 19 - 26). The mail connected with the scheduled flight from Delhi on May 27 and was flown to Cairo where it arrived on 30 May. The flight from Alexandria on May 31 was only the second on a new route. It was by Short Kent flying boat to Genoa via Crete, Athens, Corfu and Naples. However, the flight was delayed for two days in Corfu  and so it was June 3 before it arrived in Genoa. The mail was sent by overnight rail from Genoa to Basle and then flown to London where it arrived on 4 June [6, 9]. That corresponds with the Sutton Coldfield ½d paid mark of 5 June on the above cover. 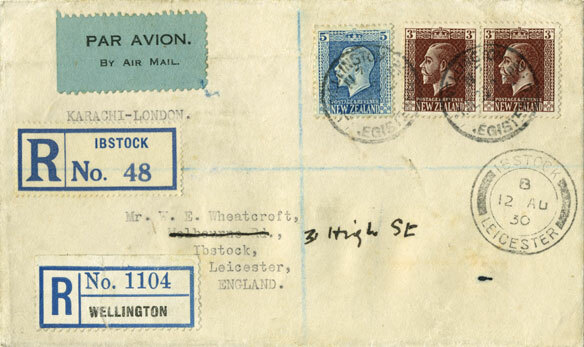 The next cover contains the first use of the 7d value of the special airmail stamps issued on 10 November 1931 on the Karachi - London route. 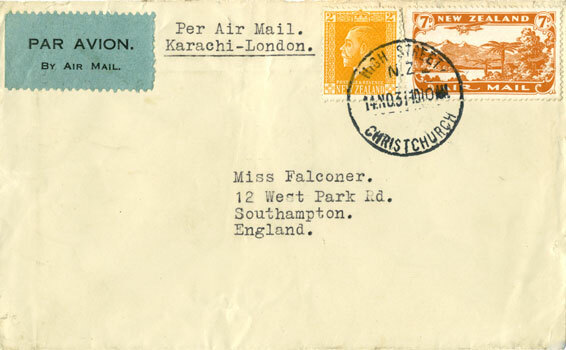 It is routed Karachi-London and postmarked 11 November, 1931 in Christchurch. The surface postal rate had been increased to 2d in March 1931 and so the total postage rate was now 9d. 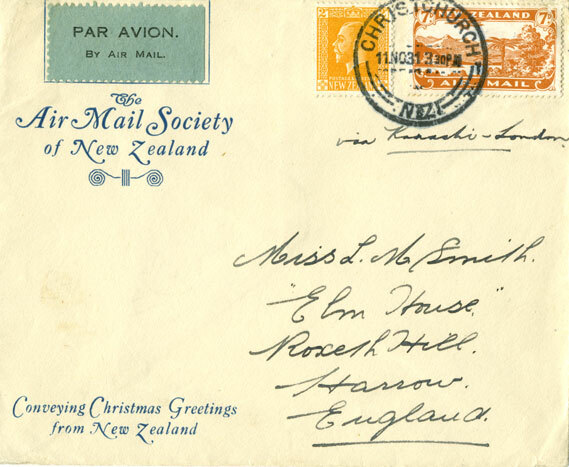 The special Christmas Greetings envelope was produced by the Air Mail Society of New Zealand for use in conjuction with the All-Australian Christmas flight to the UK whose mail left New Zealand on the same day, namely 13 November. On 13 November, mail for Sydney left Auckland on the Ulimaroa and Wellington on the Marama. Both arrived on 17 November. The mail was then carried by train to Perth and then from Fremantle on the Mooltan to Colombo on 23 November - 2 December. Colombo (in modern Sri Lanka) to Karachi was by ferry and rail. The mail was then carried on service IW 140 from Karachi to London on 10-17 December . There had been a major change in the Karachi - London air mail service in October 1931. The route from Baghdad was now to Tiberias and from there by car to Haifa. From Haifa, the mail was flown to Brindisi via Castelrosso, Athens and Corfu. From Brindisi, it was sent by rail to Paris and then flown to London. The next cover was also sent from Christchurch to the same person, but is routed Adelaide - Perth in addition to Karachi-London. It was flown Adelaide to Perth on 21-22 November and then was carried to Colombo on the Mooltan, leaving Fremantle on Monday 23 November. Use of the Adelaide - Perth airmail did not therefore speed up its journey as it was carried on the same service from Fremantle as the previous cover. It arrived in London on 17 December. 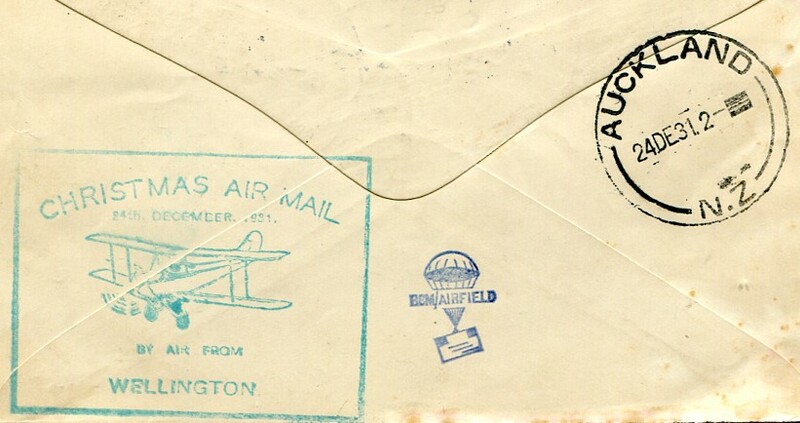 In addition to the 9d postage on the first cover, it contains the 4d airmail stamp to cover the Adelaide - Perth postage. 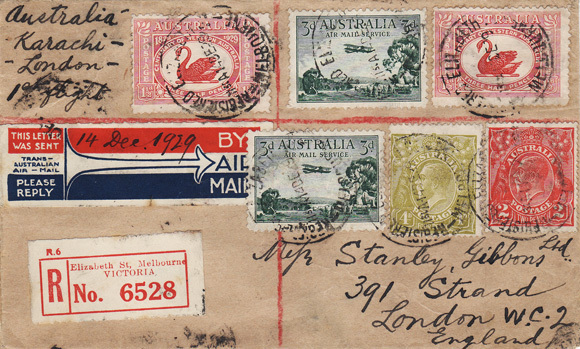 Some airmail stamps were sold by mistake in Highfield on 9 November and most were used on covers routed for the Karachi London service although they were actually sent on the All-Australian Christmas flight to the UK . This cover has routing instructions for it to be flown on three different flights: Christchurch - Auckland on the special New Zealand internal Christmas flight of 12 November; Adelaide - Perth on 21-22 November and Karachi - London on 10 - 17 December 1931. 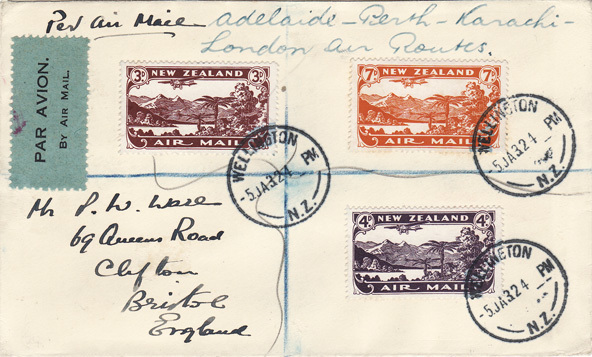 It is correctly franked with the complete set of airmail stamps: the 3d pays for the internal New Zealand flight, the 4d for Adelaide - Perth and the 7d for Karachi - London. In addition, the 2d GV covers the surface rate. It arrived in London on the same service as the previous two covers. Many early flight covers are philatelic in nature and sent on first flights. It is therefore always interesting to see covers sent on second flights. 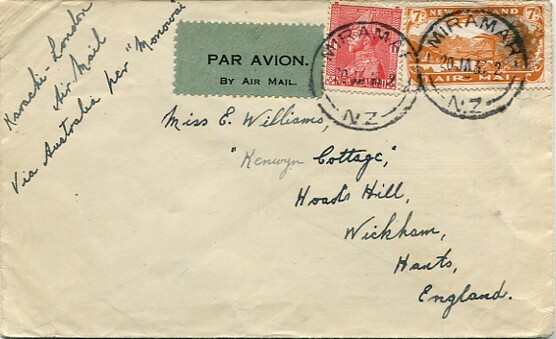 This cover is postmarked in Christchurch on 14 November, 1931 and would go from Wellington to Sydney on the Maunganui on 20-24 November . It then left Sydney by train on 25 November and carried from Fremantle to Colombo on the Otranto on 30 November - 9 December. It would be flown on flight IW 141 that left Karachi on 16 December and arrived in London on 23 December; just in time for Christmas. To publicise the advantages of air mail, the New Zealand Air League organised a network of airmail services on Christmas Eve 1931. 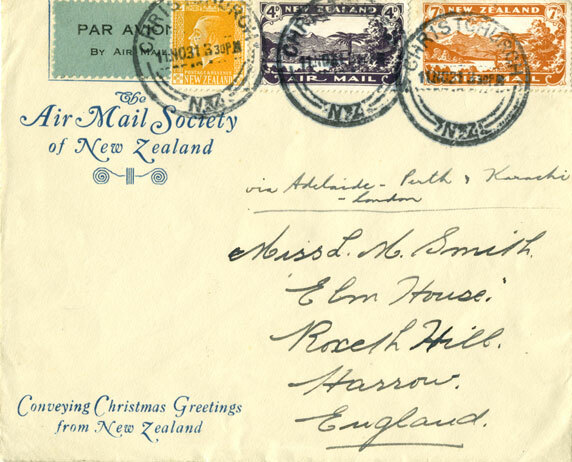 This cover is postmarked in Christchurch on 23 December and is addressed to the UK. It was sent by the regular steamer from Lyttelton to Wellington on the night of December 23 and then flown from Wellington to Auckland on December 24. It is franked with 5d to cover the Christmas airmail service, 4d for Adeliade - Perth and 7d for Karachi - London. The mail left Auckland for Sydney on the Aorangi on 28 December, arriving on 31 December. The mail was flown from Adelaide to Perth on 2-3 January 1932 and then went by sea from Fremantle to Colombo on the Cathay on 4 - 14 January. Colombo to Karachi was by ferry and rail. The mail was then carried on service IW 146 from Karachi to London on 20-26 Jan . 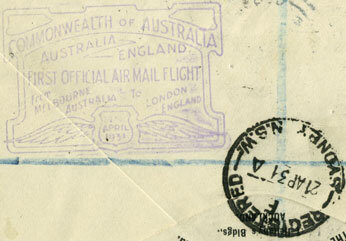 The next cover was flown Adelaide - Perth and Karachi - London. It is postmarked Wellington on 5 January 1932. It is franked with a complete set of the 1931 airmail set. The postage was 2d surface plus 4d Adelaide - Perth and 7d Karachi - London and so it is overfranked by 1d. It would be carried from Auckland to Sydney on the Ulimaroa on 8-12 January. Sydney - Adelaide was by rail and it is likely to have been flown Adelaide - Perth on 16-17, then Fremantle to Colombo on the Comorin on 18 - 27 January and sent on the Karachi - London service IW 148 on 3 - 11 February. The cover appears to be philatelic in nature and I have seen another example to the same address with a postmark on the same date. However, I am not aware of anything special about this particular flight. The rate to non Empire countries was 2½d surface rate for the first oz together with the airmail fee of 7d for the first ½ oz. 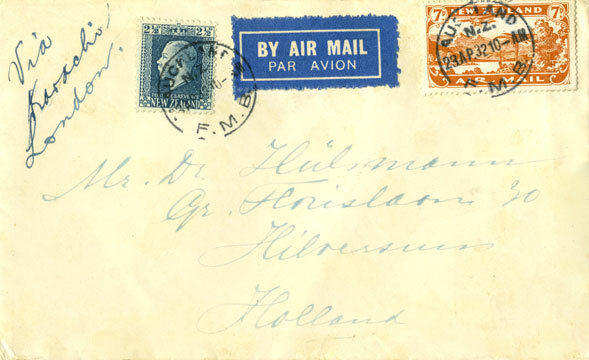 The next cover is addressed to Holland and is franked with a 2½d stamp in addition to the 7d airmail. That was the surface rate to non-Empire countries. It is postmarked in Auckland on 23 April 1932 and would have been carried from Auckland to Sydney on the Zealandia on 29 April - 3 May and from Fremantle to Colombo on the Ormonde on 9 - 18 May. It would have been flown on flight IW 164 that left Karachi on 25 May. It would be flown to London arriving on 31 May and then sent from there to Holland. There had been a further change in the route of flights that left Karachi from 20 April 1932 in that they made a stop at Limassol (Cyprus) and Rhodes. That continued until the flight that left on 28 September. However, according to Wingent , the flights of 24 and 31 May were both routed via Cairo. 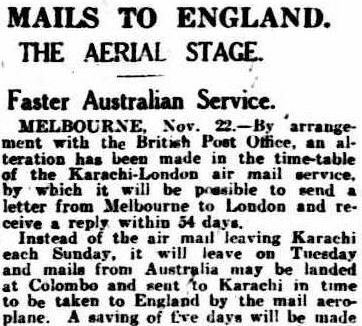 Mail could be sent from New Zealand to intermediate destinations on the Karachi - London route. This cover, postmarked in Wanganui on 28 July 1932, was sent to Greece. 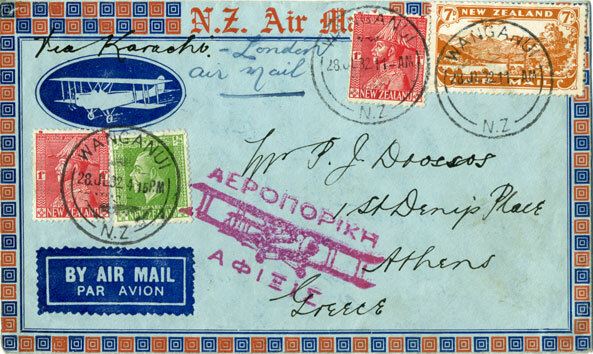 It is franked with 7d for the airmail leg from Karachi to Greece plus 2½d surface rate. The Maunganui left Auckland on 29 July and arrived in Sydney on 2 August. The cover would be carried on the Maloja between Fremantle and Colombo on 8-17 August and connect with the Karachi - London service that was due in London on 30 August. The cover has an interesting Greek arrival cachet and a smudged arrival datestamp that appears to be 28 August. That is the arrival date in Athens of flight IW 177 that left Karachi on 24 August . There is also an E20 in a circle on the back, but I am not sure what that indicates. The recipient is Drossos, a well known Greek aerophilatelic dealer, but there does not seem to be any special philatelic reason for the flight. The first New Zealand acceptances for Africa were just before this date: the first acceptance from Auckland was flown from Karachi on 27 July and the first acceptance from Wellington on 11 August 1932. On 1 June 1932, the surface rate to Empire countries and the USA was reduced to 1d per oz. The registration fee was reduced back to 3d and the late fee to 1d. That meant that the rate to the UK via Karachi air mail was once again 8d for the first ½ oz. For the flight leaving London on 1 October 1932, the route was changed from the Persian to the Arabian side of the Persian Gulf and Handley Page HP 42 airliners were introduced on the route to Karachi. Another change was that Rhodes and Limassol were dropped from the route from Athens and replaced by Castelrosso. Also, the car journey from Haifa to Tiberias was no longer necessary as the Kent flying boats now flew to Lake Tiberias (Sea of Galilee) where passengers were transferred to the HP 42 airliners. The first flight from Karachi on the new route left on 5 October and arrived in London on 12 October. This cover is postmarked in Wellington on 22 September and, as it was redirected, has a London postmark on 25 October. It was therefore flown on IW 185, the third flight on the new route from Karachi which left on 19 October and arrived in London on 25 October. It would go on the Maunganui that left Auckland on 23 September and arrived in Sydney on 27 September. It then went on the Cathay from Fremantle to Colombo on 3 - 12 October and was scheduled to connect with IW 185 at Karachi on 19 October. The surface rate had been reduced back to 1d in the middle of 1932 and so the cover is correctly franked with 7d for Karachi - London and 1d surface. There was a further change to the Karachi - London route in January 1933, when the route from Baghdad to Athens reverted to being via Gaza, Cairo, Alexandria and Crete. The first flight on the new route left Karachi on 19 January 1933 and arrived in London on 27 January. There was a further minor change on 15 February with the overnight stop now being in Baghdad rather than Basra. This cover is postmarked on 20 January 1933. It would be sent on the Monowai which sailed from Auckland to Sydney on 26 - 29 January. After being sent from Sydney to Perth by rail, it would then go on the Moldavia from Fremantle to Colombo on 6 - 15 February. That mail connected in Karachi with IW 203 that left Karachi on 22 February and arrived in London on 1 March. Acceptance of letters for a sailing of the trans-Tasman steamer closed several hours before the boat sailed. However, letters were still accepted on payment of a special late fee. 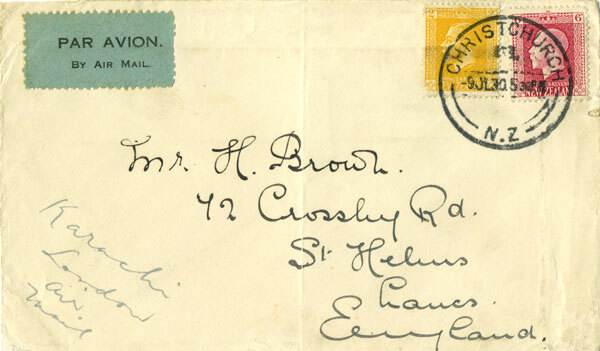 The cover is postmarked Wellington at 6pm on 29 November 1933 with a special LATE FEE cancellation. The cover is routed Per Air Mail Via Australia. The Monowai left Auckland on 30 November and was due in Sydney on 3 December. It would connect at Fremantle with the Strathnaver for Colombo on 11-20 December and at Karachi on 27 December on service IW 247 that arrived in London on 2 January 1934. The surface rate at that time was 1d and so the postage is made up of 7d Karachi-London airmail, 1d surface mail and 1d late fee. 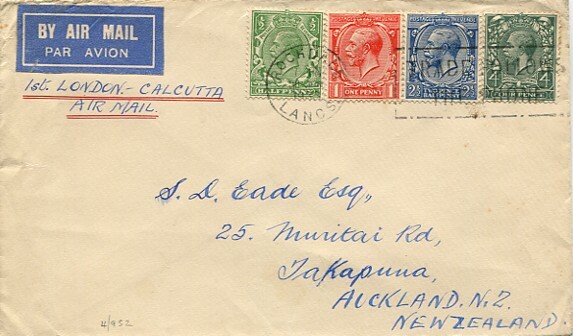 This registered cover is postmarked in Auckland on 19 January 1934 and is addressed to Denmark. It has routing instructions Adelaide - Perth and Karachi - London. The franking is 1s 6½d. Costs would include 4d Adelaide - Perth, 7d Karachi - London, 2½d surface rate to a foreign country, 3d registration fee and so the cover is overfranked by 2d. It is backstamped in Sydney on Saturday 27 January. It was not flown from Adelaide to Perth until the following week on 3-4 February and is backstamped in Perth on Monday 5 February when it connected with the P & O steamer Mongolia that sailed to Colombo on 5-14 February. One again, flying Adelaide - Perth did not speed up the service. It was then flown from Karachi on 22 February. That flight arrived in Brindisi on 26 February and the cover has two indistinct backstamps on 26 February. One appears to be Brindisi and the other Milano. The IA Karachi service arrived in London on 28 February, but it appears that this cover did not follow the routing instructions, but went directly from Italy to Copenhagen. The dates on the Danish backstamps are not clear, but appear to be 28.2.34 in Kopenhavn and 1.3.34 in Hellerup. From July 1933, the London - Delhi service was extended to Calcutta. The first flight left London on 1 July and arrived in Calcutta on 8 July. 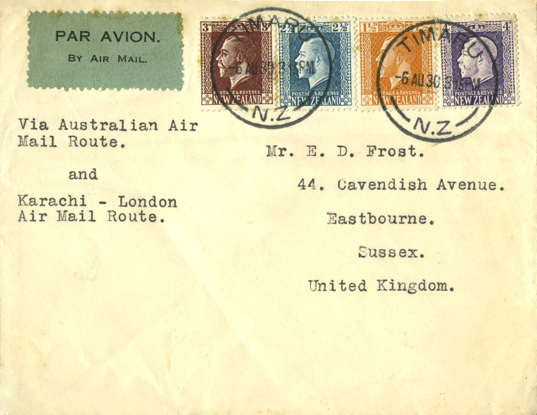 Although use of the Karachi air mail service from New Zealand to Britain remained, the service to New Zealand was withdrawn in May 1930 as it was slower than surface mail via the USA and it was never reinstated. However, air mail collectors often 'tried their luck' with first flights and sent them to unusual destinations. 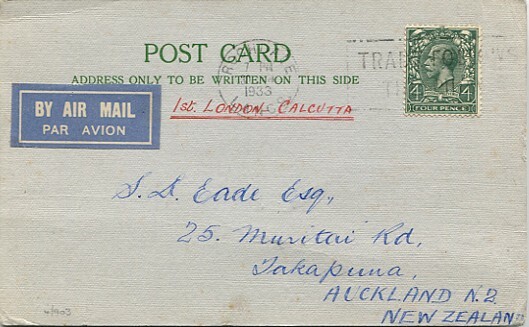 This cover is postmarked in Rochdale, Lancashire on 30 June and is addressed to Auckland with routing instructions 1st London-Calcutta Air Mail. It has the correct franking of 8d. However, it does not have the usual Karachi - Calcutta first flight cachet that was applied to the mail on arrival in Calcutta and so there is no proof that it was actually flown on the service. A postcard was also sent by the same sender to the same address and, once again, there is no first flight cachet. It is correctly franked with the correct postcard rate of 4d. Support for the idea that it would be flown is in the GPO Air Mail leaflet for May 1933 which has the footnote: Correspondence can be sent by air mail, if the sender so desires, to countries not directly served by the air services shown in this leaflet upon payment of the air postage, as shown above, to the country through which the letter is to be forwarded. ... Correspondence sent by this means must be superscribed to indicate the poster's intention, e.g., "By Indian air service to Karachi." Flying from Karachi to Calcutta would have added a delay to any mail to New Zealand. If it was flown then the route from Calcutta would likely be to Colombo via Madras and on by sea to Freemantle in Australia. The next cover is routed Adelaide - Perth and Karachi - London as well as being carried on the first trans-Tasman flight on 17 February 1934. It has the correct franking of 1s 6d. The trans-Tasman rate of 7d covered onward surface delivery to the UK. The extra rate for the Perth-Adelaide airmail service was 4d while the Karachi-London airmail service was 7d. It was postmarked in Wellington on 19 January which is two days after the issue of the special trans Tasman stamp. The backstamp shows that it had arrived in Sydney on Saturday 17 February. From 6 September 1930, the Adelaide - Perth service left on a Saturday rather than Sunday as before . This cover would therefore not be flown from Adelaide until the following Saturday (24 February) arriving in Perth on 25 February and connecting with the Ballarat from Fremantle to Colombo on 26 February - 7 March. It was then flown on the IA flight that left Karachi on 15 March and arrived in London on 22 March . That corresponds with a manuscript on the back of the cover stating that it was received in Glasgow on 23 March. So it was 34 days in transit after leaving New Zealand. A cover to the same address sent via US airmail around the same time was only 30 days in transit. On this occasion, the Adelaide - Perth air mail service did not speed up the mail, trans-Tasman. 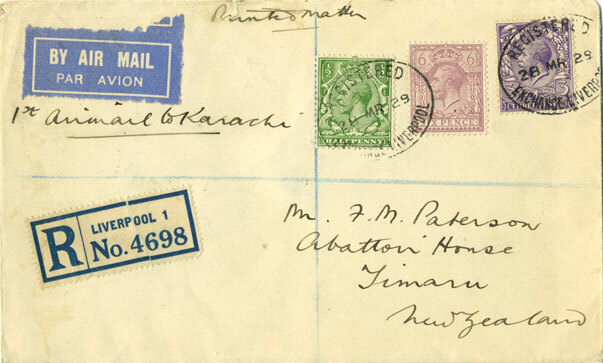 covers addressed to the UK and routed only on the Karachi - London service, also arrived in London on 22 March. Walker  states that the arrival date is unknown. This next cover was flown on Ulm's second trans-Tasman flight on 14 April. It is addressed to England. 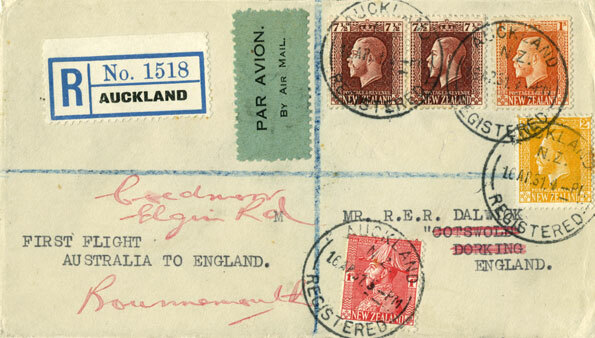 From Sydney it was taken to Karachi by surface and then flown on the Karachi - London airmail service from 9 - 17 May which required the second 7d stamp . The route from Fremantle was by sea to Colombo and from there by surface to Karachi. 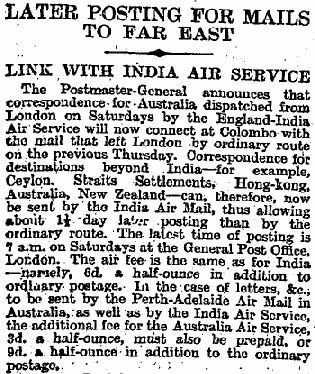 According to , after October 1932, an air mail service by Tata Sons Ltd was available for the Madras - Karachi leg of the route from Colombo, but I have not seen any mention of it being used to expedite mail to/from Australia and New Zealand. In December 1934, the Empire Air Service was extended to Australia and that then became the standard airmail route from New Zealand although, of course, the New Zealand to Australia leg was still by sea. The service of surface to Karachi and air from there was no longer available. All scans were made by the author. London to Australia via Karachi, 1929, Bill Legg, Air Mail News, vol 47, pp 254-6, February 2005. 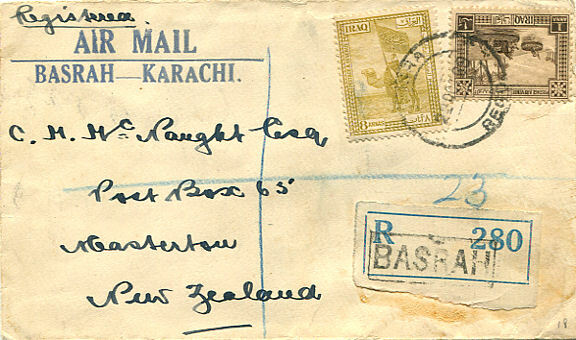 Airmail to New Zealand via Karachi, March 1929, Robert G Clark, The Kiwi, vol 54, no 3, pp54-55, May 2005. K C Sanford, Air Crash Mail of Imperial Airways and Predecessor Airlines, published by Stuart Rossiter Trust Fund, 2003. The Route from Ceylon to Karachi in 1935, Air Mail News, vol 45, pp 245-6, February 2003. Uncle Will and his Airmail Friends, Stan Wheatcroft, Air Mail News, vol 48, pp 29-40, May 2005. The Postal History of British Air Mails, E B Proud, 1991. L Giles, Q72, BAeF Bulletin, no 116, p 10, April-May 1994. Postage Rates, The Mail Coach, vol 21, no 6, pp 251-253, August 1985.